Sixteen years ago after a class at City College I went looking for a place to enjoy a good cup of coffee. That wasn’t easy 16 years ago when coffee shops weren’t so common. I finally found one at Santos in South Park. While I enjoyed my coffee, curiosity got me out of the coffee shop wandering the sidewalks of this charming neighborhood. An idea was born that day: Urban Safaris, my walking tour business. Sixteen years later I now have 15 different neighborhood walks, but not from Santos Coffee in South Park…Santos is now in North Park. They have picked another charming neighborhood in a small pocket of local businesses and bungalows along Thorn Street. Open from 6:00am-7:00pm daily, it’s a great place to begin your day with a cup of their dark joe or take a break in the afternoon with their Banana Cream coffee. That’s right, Banana Cream! It didn’t sound good to me, but I had to try it & I’m glad I did…it does taste like banana cream and that’s not a bad thing. They roast their own beans and get creative with their roasts. They also have a nice array of baked goods and a comfortable outdoor patio (pictured) where dogs are welcome. In Old Town they serve coffee from a cart near the Cygnet Theatre on Twiggs St. Parking is free on the side streets off Thorn with little competition for a spot (unless it’s close to closing time when new customers are heading to Thorn Street Brewery across the street). Come for coffee then go on your own neighborhood Urban Safari! Sixteen years & counting my Urban Safaris are going strong. Walks are Saturday mornings, January-October. The 2017 Saturday schedule will be posted by late December on www.walkingtoursofsandiego.com. Thanks, Santos Coffee, for getting me started! 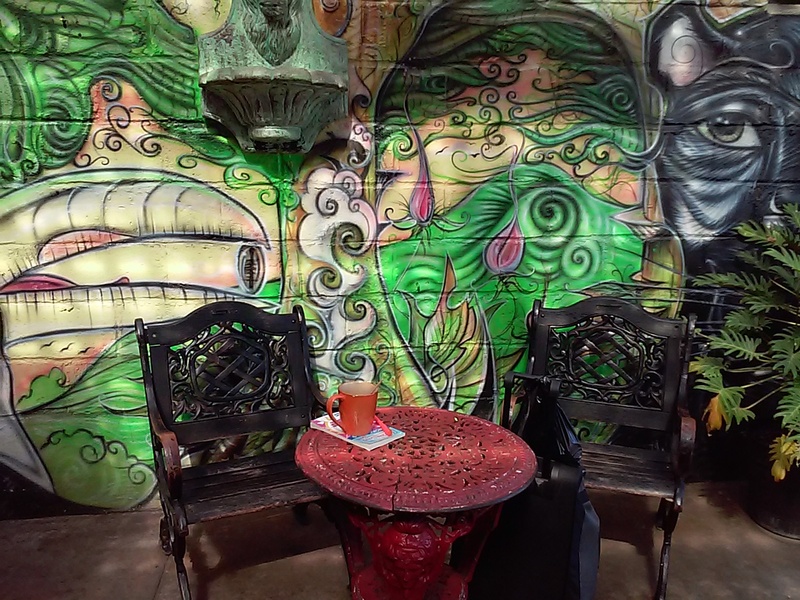 This entry was posted in art, brewery with coffee, Coffee shops in San Diego and tagged brewery, North Park. Bookmark the permalink.